If you’re just joining us in this 3-part series, check out Part 1: Setting the Stage and Part 2: Liquid H₂O to be brought up to speed. 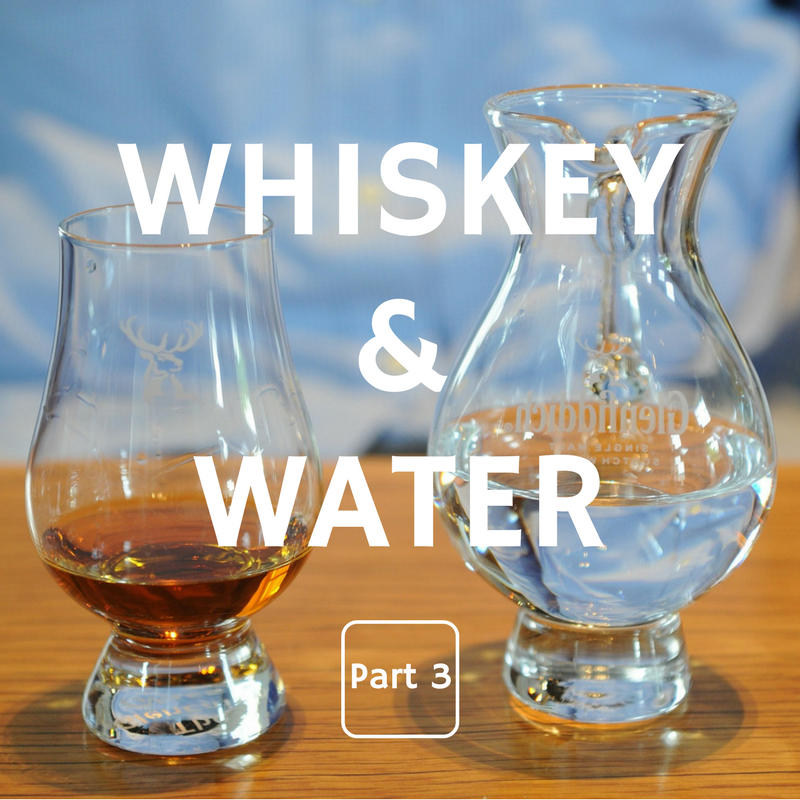 In part 3 we’re going to answer the question: What happens when you add ice to whiskey? Ice has some cool tricks up its sleeve. It does three very interesting things to your whiskey, two of which water alone can’t do. Ready to find out what they are? Let’s get started. As ice melts, it adds water to your whiskey. So what does that do to your glass of golden spirit? It does all the things that adding water does. We talked about those things in part 2. If you read it, then jump down to the next paragraph, you already know what’s up. If you haven’t had a chance to read it yet, then click here. Now let’s talk about the two cool things – pun intended – ice does that water alone can’t. Ice cools, or brings down, the temperature of your whiskey. This is an obvious point. What’s not obvious is the dual effect of both suppressing and releasing aromas. Ice suppresses some of your whiskey aromatics. What’s that mean in terms of flavor? It means your whiskey’s flavor will be more subdued. Ice knocks down the highs, and fills in the lows. How does it do that? Scientifically speaking, as molecules are chilled they move around less and start to clump together. Less movement means that less aromatic molecules make it out of the glass and up to your nose. More clumping means you smell less individual notes and instead get a melded conglomerate. A practical illustration would be how a pile of garbage smells on a hot summer day, verses how that same garbage smells at 32° Fahrenheit in winter. There’s a big difference. So should you add ice to your whiskey? Only you can answer that question. To help you make that call, though, here are some things to think about: What whiskey are you drinking? Is it an already mild, delicate whiskey? Or is it a big bold whiskey that could use a little taming? What’s the ambient temperature of where you’re drinking? Is it hot out? Heat is known to spice up ethanol’s burn. Maybe your whiskey needs a little chilling. Or is it cold out? Do you want to drink something cold in the cold? Now, because of ice’s suppressing effect on whiskey, most whiskey purists are adamantly against it in their whiskey. They feel that you’ll miss out on flavors if you add ice to whiskey. Is this true? Let’s take a look. Ice releases unique aromatics. What does that mean? It means there are certain aromas that you’ll only smell if you add ice. How does that work? It’s time for another science lesson. Ethanol molecules in your whiskey link together and form little ethanol bubbles. The scientific term for this is ethanol micelles. Trapped inside of these bubbles are aromatic compounds, or in other words, smells that are locked away from you. The good news is these ethanol bubbles are water soluble. That means that adding water to your whiskey dissolves the ethanol bubbles and releases the trapped aromas. So all you need is water, right? Not right, because there’s a catch. The solubility of these ethanol bubbles is temperature sensitive. The warmer the bubbles are the less water breaks them apart. That means to fully unlock those trapped aromas you need to chill your whiskey while adding a little water. Happily, ice does both of those things simultaneously! Interestingly, whiskey’s exposure to wood encourages ethanol molecules to link together into bubbles, or micelles. So the more, or longer, whiskey is in the barrel the more ethanol bubbles will form. In theory, that means the older your whiskey is the more flavor there is to be unlocked from adding ice. Isn’t whiskey science cool? Let’s recap this article: Adding ice to your whiskey brings some of the same benefits as adding water. And while it does suppress some flavors, it’ll unlock otherwise inaccessible ones. So, you now have three articles worth of whiskey and water knowledge. What will you do with it? Will all that knowledge find an outlet? Will you get out a few glasses and experiment? Or better yet, will you invite a friend over to taste test with you? Only you can answer those questions. As for me, well, you already know what I’ll be doing. P.S. Did you enjoy this series? If so, leave a comment below or like this post so I know if you’d like to see more articles like these. Thanks! Just a side note from John: We’ve really really enjoyed having Zac write this series for us and share his knowledge. I cannot tell you enough how appreciative we are and how much we’ve enjoyed getting to know him. If you enjoyed it too, please let us know. Make sure to also support Zac by visiting the Whisk(e)y Smiths site and their Instagram!